Before I could do too much though, I had to stop and buy myself a ladder. Although there are many similar multi-purpose designs available from Screwfix, Toolstop and several others, I decided to take a chance with BPS Access Solutions. 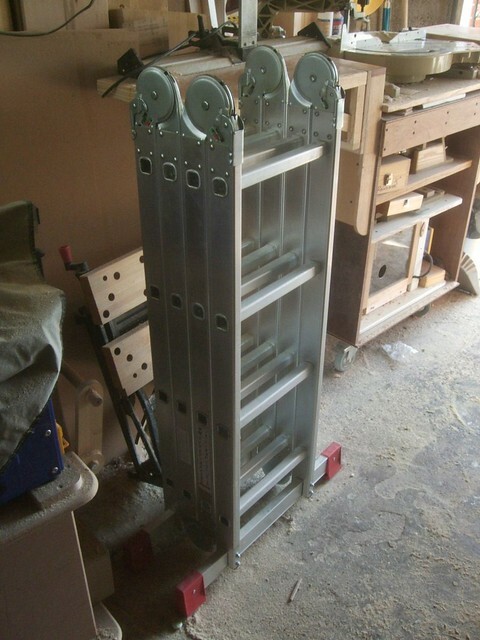 You pay a little more than what you would do elsewhere but, you also got a pair of aluminium platforms thrown in, along with next-day delivery (provided your item is in stock…). I ended up ordering the large 4×4 rung ladder, as the 4×3 size wouldn’t be available for a few weeks and I needed this urgently. There’s a video on YouTube that demonstrates the reliability of this particular ladder (that’s how I discovered the company) and, with a lifetime guarantee included, I was confident in my purchase. 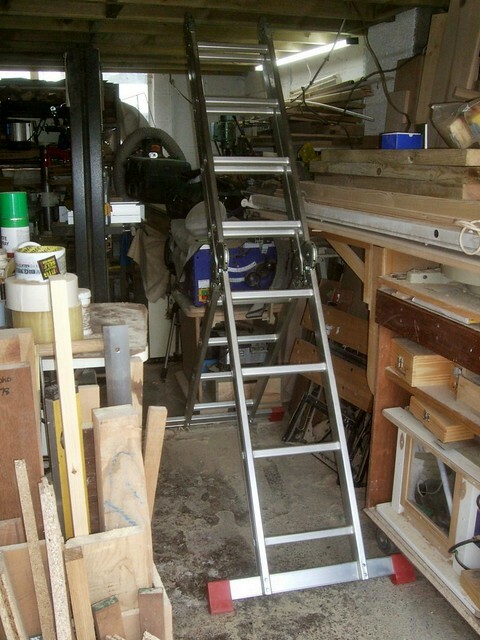 In my workshop though, it’s only really convenient to use it as a stepladder! When it’s not required though, the ladder folds up in to a fairly convenient size. I’ve already started re-positioning the strip lights for best effect. This time around, I’m thinking it would be best to have the longer 5ft tube running parallel to the side wall. 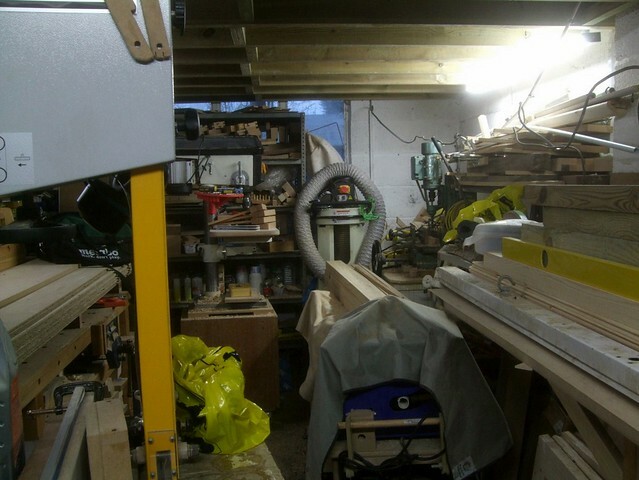 If I can clear the space at the back of the unit then, I should be able to bring some daylight back in to the workshop again, to help illuminate that area. A brand-new pair of brushes arrived for my Hitachi circular saw, thanks to an eBay seller (I couldn’t face the wait with the other company I’d previously ordered them from). 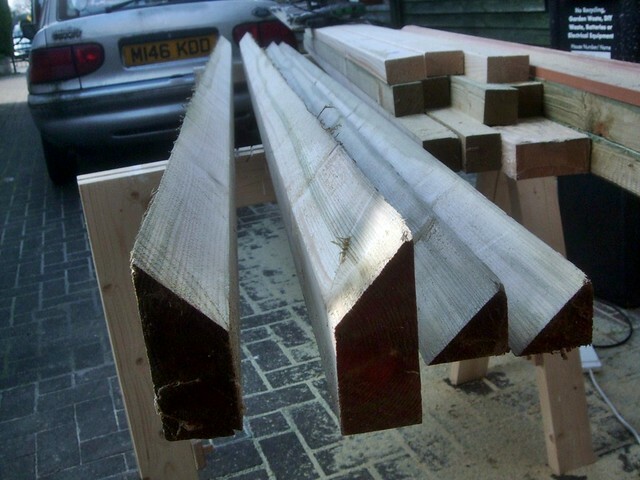 So, with my saw up and running again, I continued ripping all my lengths of 4x2in timber in to 2x2in sections. A lot has gone away from this blog recently and, it looks as though I won’t be in this workshop for too much longer. 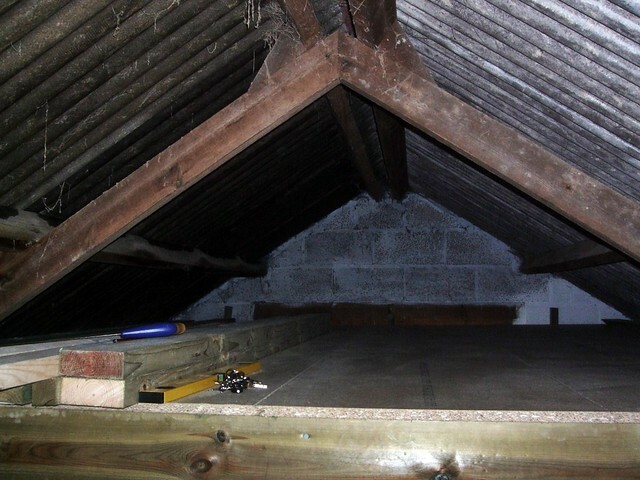 With that in mind, I’ve decided to put the plans for insulating the roof space on hold, as I can’t really justify spending another £200-300 right now. I would still like to replace the up-and-over door at some point but, I don’t think that will happen, to be perfectly honest. 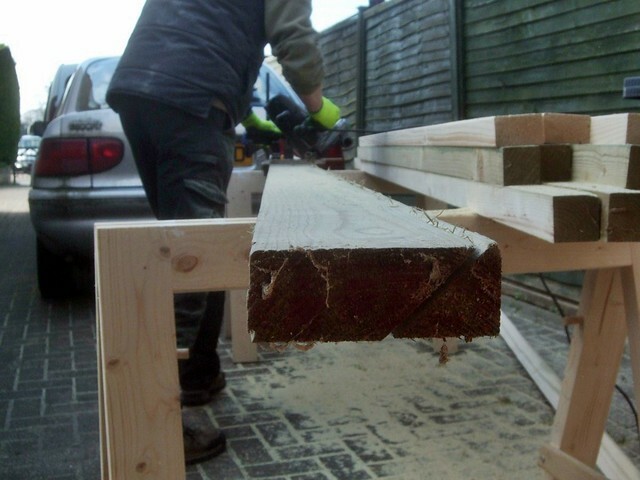 Above, I’m ripping a 45° bevel down one edge of the 5x2in timber I bought. 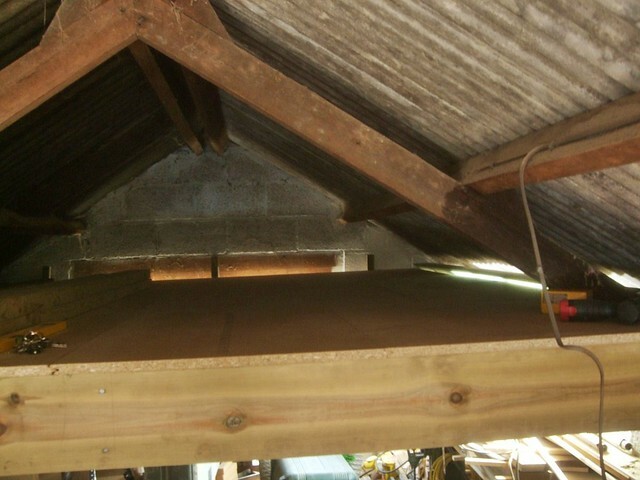 This idea would, basically, provide me with a fixing point for thin ply or hardboard sheets that I would use to hide the roofing insulation and clad the inner surface of the roof space. I just felt that, for some reason, it was worth making the effort and getting this part done. 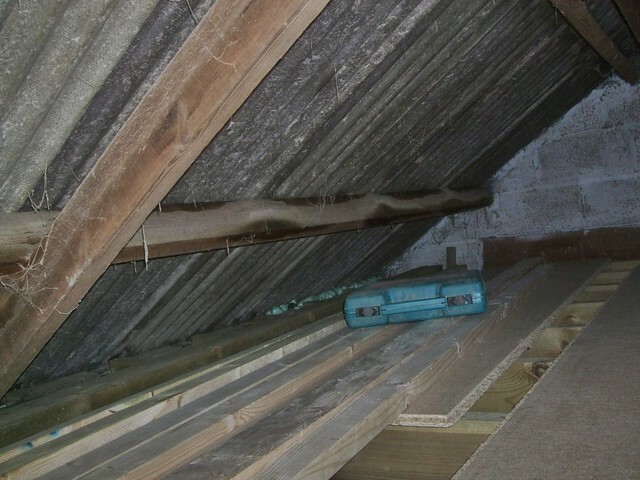 It was also necessary to do before fitting the sheets of chipboard. Once again, the Atkinson-Walker blade did a very good job and, for a 24-tooth blade, it left a reasonable finish as well. 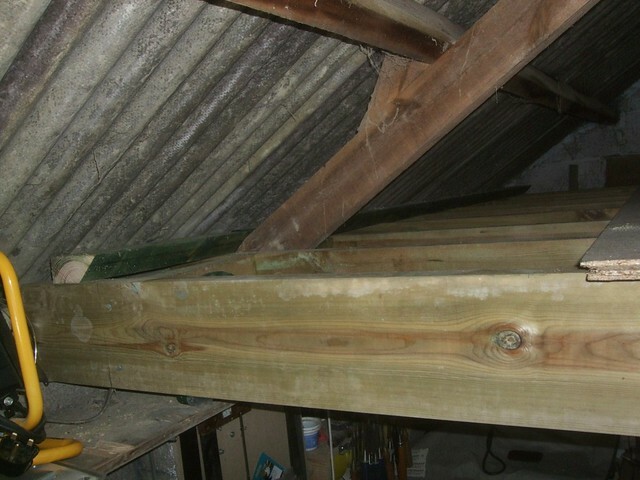 Hopefully, that last photo explains to you what I mean… I’m still in two minds as to whether or not I should use up my stock of 2x2in and frame the rest of the roof (between the purlins) anyway… I’ve bought it so, without any other plans, I may as well use it and get it out of the way, right? 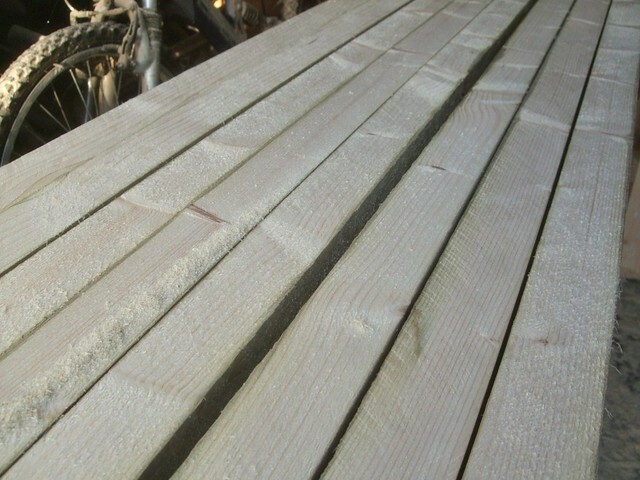 I should mention that I also used a blade from Summit Saws to cut the chipboard sheets where necessary (though, for the sake of convenience within a small space, I made most of the cross-cuts using a hand saw). Its 230mm diameter was fine for this task and, with 48t, it left a superb finish on the 18mm edge; the bear minimum of breakout or chipping, even on the upper face. It didn’t struggle and, unlike one of the two blades supplied with my saw, it runs perfectly parallel to the edge of my saw’s base! One trick I forgot to mention previously was the inclusion of these folding wedges between the end wall and the last or first joist. 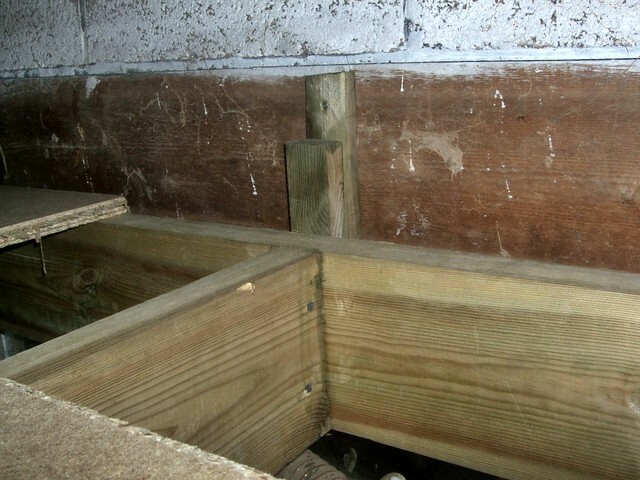 This simply stops the joist from vibrating while skew-nailing the last nogging in to position. I’ve already begun making good use of this new space and emptying some of the shelves down below. I have a couple of tricks in mind of how to go about this in highly efficient manner so, I may try and do a brief video-tour in the next couple of days. With all the extra wood I’ve accumulated from this build, it’s also quite gratifying to get this far and find I still have one full 2400x600mm sheet of chipboard going spare! 😎 I’m already dreading the thought of moving the workshop, even though I may not go far and, whatever does happen, I’ve probably got a good six-months left in this current space.